Their latest release (which is Kathy’s 21st album), Horrible World, follows in the tradition of the previous five Kathy Kallick Band albums; all received widespread critical acclaim, and all spent a year in the upper echelons of the national charts. Horrible World is currently the #2 album on the Folk Radio charts, and the Kathy Kallick Band are the #1 artists. In addition, both the album and the song “It’s A Beautiful World” have entered the National Bluegrass Survey. Kathy Kallick’s exceptional career includes winning a Grammy and two IBMA Awards, receiving a Lifetime Membership from the California Bluegrass Association, co-founding the internationally-acclaimed Good Ol’ Persons, and collaborating with the country’s top acoustic musicians – including her mighty current band: Annie Staninec (fiddle), Greg Booth (dobro, banjo), Tom Bekeny (mandolin), and Cary Black (acoustic bass). 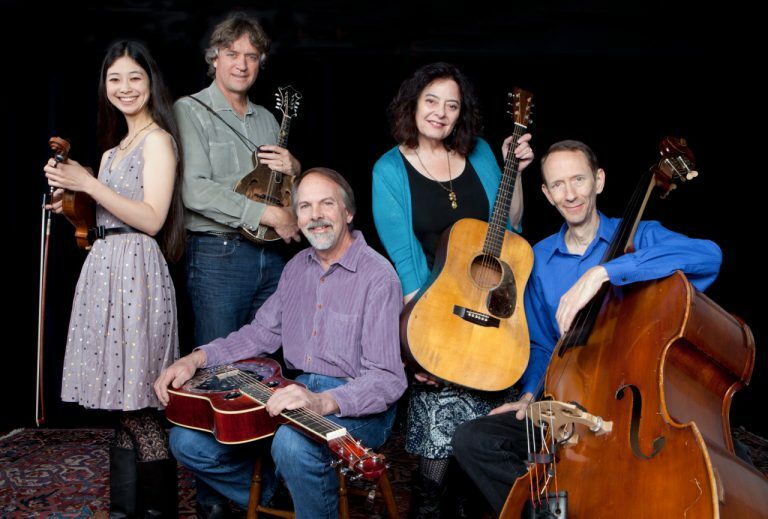 Led by one of the music’s extraordinary composers and vocalists, the Kathy Kallick Band is among the most dynamic and affecting groups in contemporary acoustic music, and have nearly as much fun as the audience when performing. The material is compelling, the songs have lots to say, the tone ranges from humorous to bittersweet to soulful, the instrumental playing is dazzling, the vocals luminous, the presentation inclusive.